3D product rendering is a beneficial asset for getting stunning visuals and using them on e-commerce websites. Product images help to present a website’s content in the most appealing way which is crucial for any successful marketing campaign. The amazing 3D models of the benches look like a real work of art thanks to 3D product rendering. 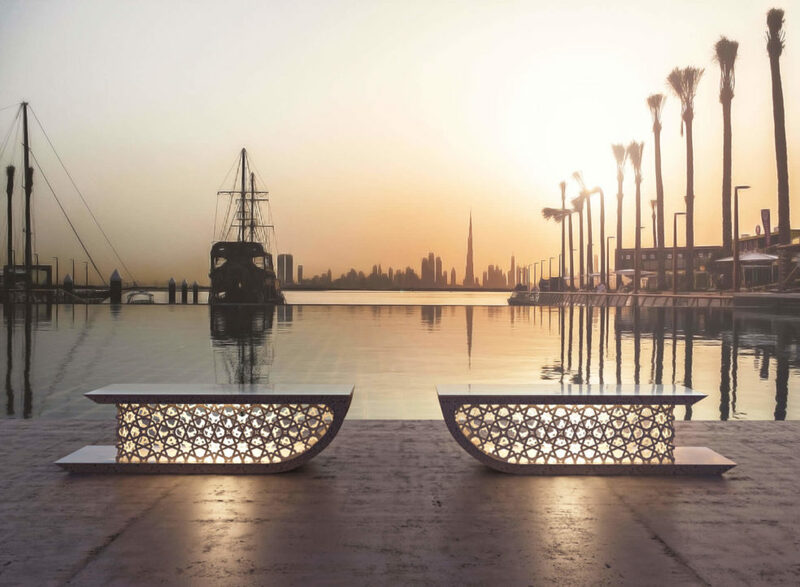 Our 3D Artists created the grand scene for these benches in the form of the magnificent pier. Photorealistic 3D visualization also helped to make the lively background of the busy metropolis in the distance. Such fine example of a lifestyle product image is perfect for bringing attention of clients. But what really made the street furniture outshine everything else is the beautiful sunset lighting. The 3D Artist created visual effects of fog and smooth color transition of sunset sky. The lighting in the rendering accentuated the unique details of the benches: the transparency of glass, illuminated pattern, smooth surface etc. Thanks to these features the lifestyle image presented the furniture as a gorgeous designing and modeling project. Want to get amazing photorealistic 3D product renderings for successful digital marketing campaigns? Contact UFO3D for professional product rendering services and get top-notch advertising materials.